Are there nutritional tradeoffs in increasing women’s time in agriculture? The following post, by A4NH-IFPRI collaborator Hitomi Komatsu, was originally published on the Agrilinks site. This post was updated in 2018 to reflect the findings of the final paper, which was published in Food Policy. Malnutrition is a severe problem, especially in poor households in developing countries. Many families are not well nourished because they do not have access to nutritious and diverse diets. Studies have shown that one way to improve nutrition among rural households is to increase women’s engagement in farming. Increasing women’s control of food production or earnings, and increasing their power to make decisions leads to better nutrition for their families, because women are more likely to spend their earnings on nutrition-enhancing purchases. 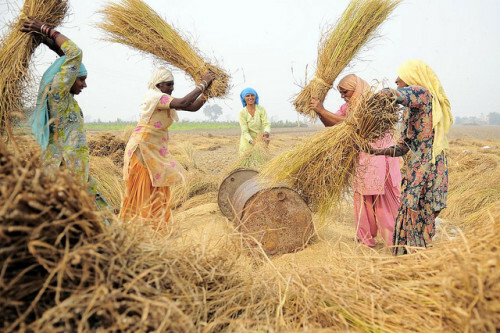 But there is a paradox: Increasing women’s time in agriculture may also have an adverse effect on their own and their families’ nutrition, taking time away from nutrition-improving domestic work such as preparing food, feeding, childcare, collecting water and firewood, and engaging in good hygiene and sanitation practices. Intensifying women’s agricultural engagement is a concern if it leads to compromising their own nutrition or that of their children. Is there a relationship between women’s time in agriculture and maternal and child nutrition? And does a reduction in women’s time in domestic work correlate with poorer maternal and child nutrition? Using time use and nutrition data from Bangladesh, Cambodia, Ghana, Mozambique, and Nepal, my IFPRI colleagues and I examined these questions. First, we found that in nearly all the countries we studied, women with fewer assets are more time-burdened than women who are not asset-poor: they spend more time cooking, caregiving, and doing other domestic chores—and engaging in agricultural and nonagricultural work—than their better-off counterparts. In addition, we found that women's domestic work and cooking time are positively correlated with more diverse diets. In certain contexts, when women in poor households sacrifice domestic and cooking work to other tasks, the quality of their diet—and that of their children—suffers. However, in non asset-poor households, children start with better diets than poor children, and their diets were less sensitive to changes in women’s time in cooking or domestic chores. In other words, households with more assets achieve better nutrition outcomes with less time in domestic work than those with few assets. Our results varied depending on the country. Poor women spend more time in agricultural work than nonpoor women in all five countries, except Mozambique. These long hours in agricultural activities were negatively correlated with the diet quality of non-poor women in Mozambique. But women's time working in agriculture was positively associated with dietary diversity for poor women and children in Mozambique, suggesting that agriculture is an important source of food and income for asset poor households. The results imply that the impact of time in agriculture on nutrition depends on social economic status and local context. To respond to these context-sensitive realities, those designing agricultural interventions should assess the gender roles in agricultural and domestic work, including identifying who controls what in the agricultural process. This is especially important for poor women who are already time constrained. Interventions that increase women’s agricultural workload could have unintended consequences on nutrition because of the time taken away from domestic work. In contrast, interventions that save time in agricultural tasks could allow women, or men, to spend more time in nutrition-improving activities. Agricultural interventions could also impact existing gender roles, causing a negative or positive effect on nutrition depending on who controls the products or the income received from the products. Regardless of the intervention, transforming gender norms—with men taking on a greater role in domestic work—could help reduce women’s work burdens, and improve the nutrition of the household. Komatsu, H., Malapit, H., J., Theis, S. 2018. "Does women's time in domestic work and agriculture affect women's and children's dietary diversity? Evidence from Bangladesh, Nepal, Cambodia, Ghana, and Mozambique." Food Policy. In press. Doss, C. R. 2001. “Designing Agricultural Technology for African Women Farmers: Lessons from 25 Years of Experience.” World Development 29(12): 2075-2092. Headey, D., A. Chiu, and S. Kadiyala. 2012. “Agriculture’s Role in the Indian Enigma: Help or Hindrance to the Crisis of Undernutrition?” Food Security 4 (1): 87–102. Johnston, D., S. Stevano, H. Malapit, E. Hull, S. Kadiyala. 2018. “Review: Time Use as an Explanation for the Agri-nutrition Disconnect? Evidence from Rural Areas in Low and Middle-income Countries." Food Policy 76:8–18. Kadiyala, S., J. Harris, D. Headey, S. Yosef, and S. Gillespie. 2014. “Agriculture and Nutrition in India: Mapping Evidence to Pathways.” Annals of the New York Academy of Sciences 1331:43–56. Malapit, H. J. L., and A. R. Quisumbing. 2015. “What Dimensions of Women’s Empowerment in Agriculture Matter for Nutrition in Ghana?” Food Policy 52:54–63. Ruel, M. T., and Alderman, H. 2013. Maternal and Child Nutrition Study Group. “Nutrition-sensitive interventions and programmes: how can they help to accelerate progress in improving maternal and child nutrition?.” The Lancet 382(9891): 536-551. Smith, L. C., U. Ramakrishnan, A. Ndiaye, L. Haddad, and R. Martorell. 2003. The Importance of Women’s Status for Child Nutrition in Developing Countries. Research Report 131. Washington, DC: International Food Policy Research Institute.